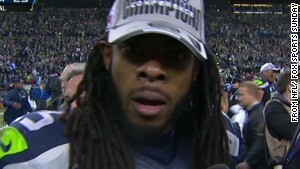 Watch Rachel Nichols' interview with Richard Sherman on CNN's Unguarded at 10:30 p.m. ET Friday. 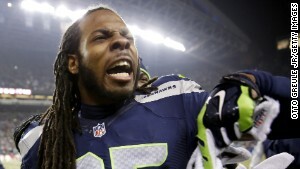 (CNN) -- The NFL has fined Seattle Seahawks cornerback Richard Sherman $7,875 for taunting tied to the recent NFC Championship Game, a league spokesperson said Friday. The NFL official did not specify whether the fine stemmed from an on-the-field or off-the-field infraction. 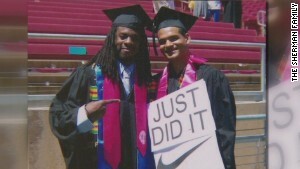 Sherman was penalized during the game for putting his hands to his throat in a choking gesture directed at the San Francisco 49ers quarterback. 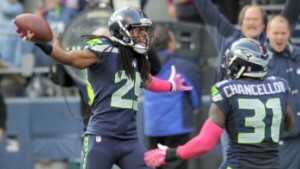 Sherman had just deflected a pass that saved the victory for Seattle. Immediately after the game ended, Fox Sports sideline reporter Erin Andrews interviewed Sherman and he boasted to being "the best" and maligned one of his San Francisco opponents, receiver Michael Crabtree. Those remarks soon became national news as many fans and commentators derided what they characterized as Sherman's poor sportsmanship.